Raspberry rose jelly is a beautiful way to enjoy ultra-pure raspberry flavor with no seeds. The rose water makes the raspberry taste even more raspberry! Everyone has a texture thing of one sort or another, don’t you think? My texture thing is not extensive, really it’s not. Oysters? No problem. Pate? Yes please. Labneh and mayo, just fine. But Ice chips? Hellz no. Grainy hummus? Um, never. And while we’re at it: berries with lots of little seeds? It’s a love-hate situation. Raspberries (and their cousin the blackberry) when eaten fresh, their seeds don’t much get in the way or bother me. I can ignore them for the whole fresh berry experience. But boil razzles down for a jam or a sauce, and the seeds are now front and center. They get in the way and I find myself getting kind of down on my second-favorite jam for it (apricot is #1, always). It doesn’t help that my mama can’t take the seeds even for one second. And that woman loves her jam, daily. When I mentioned during our annual raspberry-picking expedition that we’d be making jam, she said, “not for me.” Geez Mom, that’s the main thing we do with our raspberries aside from eating as many as possible out of hand in the first day after picking, or covering them in chocolate, before they start to go soft. I knew why though, and no sooner did I say the word “seeds” than she was nodding knowingly and pointing to her teeth. This is the moment that pushed me over into the jelly vs. jam camp. Like the raspberries themselves, jelly for me has always incited mixed feelings. 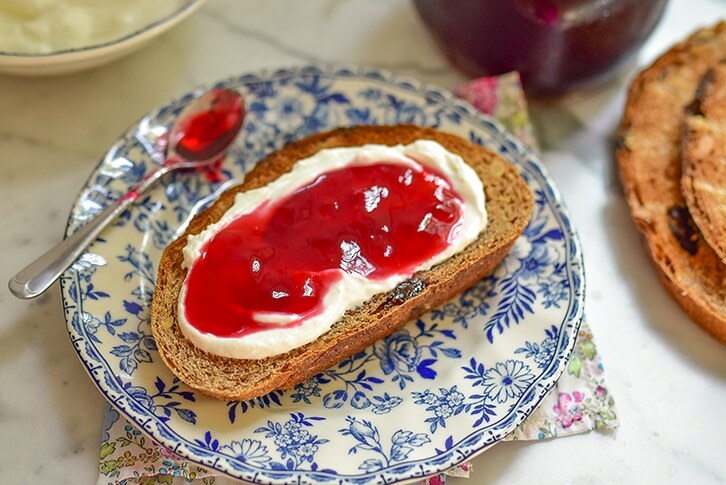 The word jelly takes me to the grape jelly of all of our childhoods (or at least my friends’ childhoods), and all I can think of is a peanut butter and jelly sandwich I don’t want to eat. But jelly in the context of a French gelee, or jelly in the context of jell-o, and I’m in love. To add to my blossoming jelly excitement, a few years back Dan and I popped in on his mom Louise, who was sitting at her kitchen island enjoying a taste of the raspberry jelly a friend of hers had made (raspberries were on sale at Meijer, two for $5. It was mid-winter in Michigan, so a great deal). She made the visit more special, as Lebanese ladies always do, by putting a little spread out of the jelly, some toast, and some labneh. Cup of coffee. We ate every last bite of that bright pink, sweet-tart jelly (super selfish of us not to leave enough for another round for her next morning at least…),, and while we have enjoyed countless abundant meals in that there kitchen, this one that stays with me and gives me intense homemade raspberry jelly cravings. What surprised me in my raspberry jelly research is that you need nothing more than the fruit itself, sugar, and lemon juice. Natural pectin and the lemon work their magic to give the jelly it’s gel, so no additional pectin is necessary. 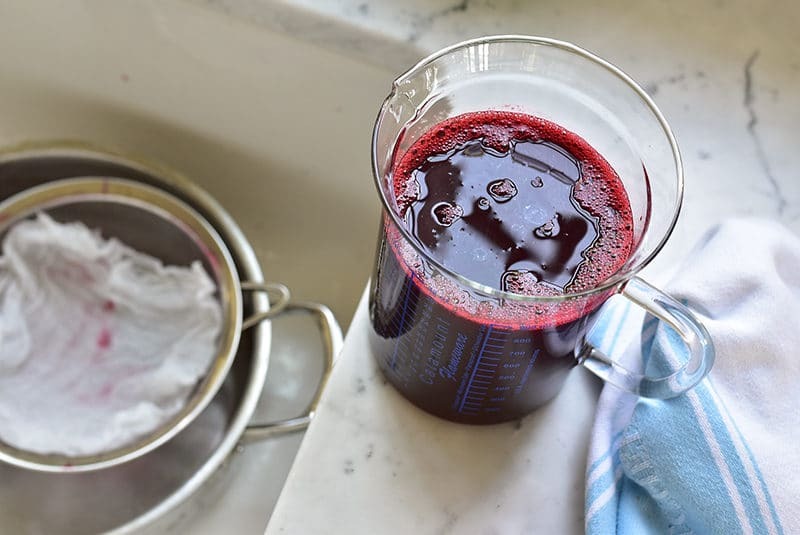 But there are plenty of recipes that do include the pectin (like Sure-Gel), or another high pectin fruit like apple, and that’s all good too. I wanted pure and simple for my jelly intro, and to see if the method without added pectin really work, so my only addition is a couple of teaspoons of rose water. 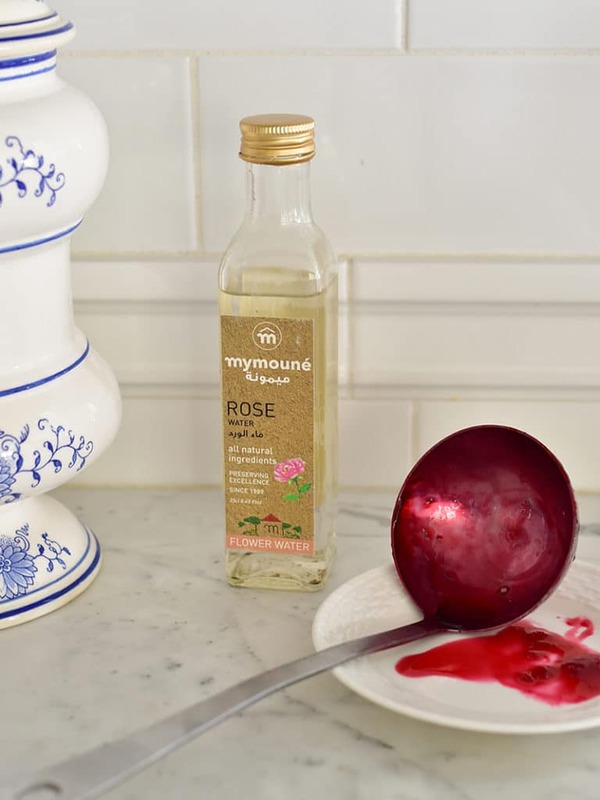 You won’t taste rose so much as more raspberry flavor, which rose water does so beautifully to any red berry it touches. What I discovered is not to expect a jelly so stiff that it’s like a jell-o cup when you spoon some out. 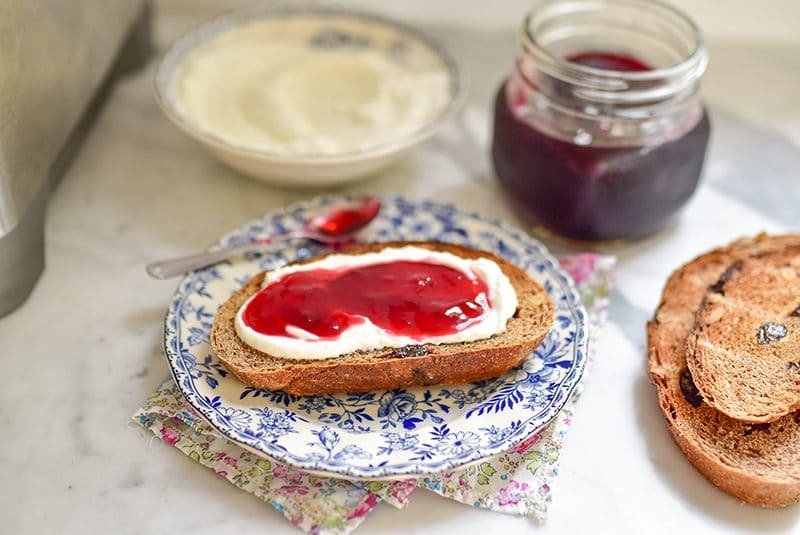 My raspberry rose jelly is a bit softer than that, but I store it in the refrigerator and that also contributes to enough body to spoon and spread. Put on your apron for this project, my friends. Red will splatter, and you want to enjoy the raging pink rather than be irritated with it. Keep tasting spoons at the ready, because the flavor and aroma explosion is too good not to taste every step of the way. Then find the best loaf of bread available, same goes for the labneh (if you can’t have actual labneh, try Fage whole-milk or 5% from the yogurt aisle). Cup of coffee. Now the only texture thing you have is one to love. 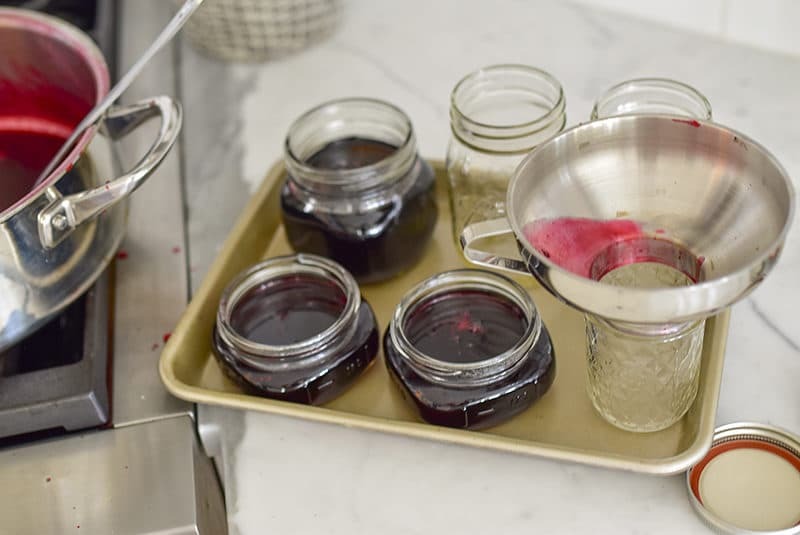 This simple jelly recipe sets up from the magic of lemon juice and the natural pectin in the raspberries. 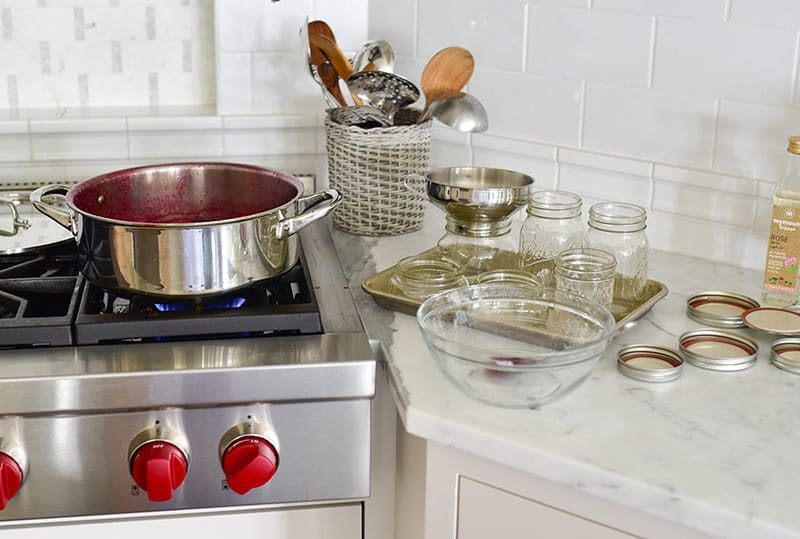 You can process your jars to can for shelf-life, or keep them in the refrigerator to extend their life. Honestly, in the refrigerator with no processing, I've opened jars many months after summer and they are still perfect. With this jelly though, I fear there won't be any left to enjoy at a later time.... I use a varied array of jar sizes and shapes, faceted ones especially show off the jelly's color. Sort the raspberries well, but I don't wash mine, to preserve the glorious raspberry essence. 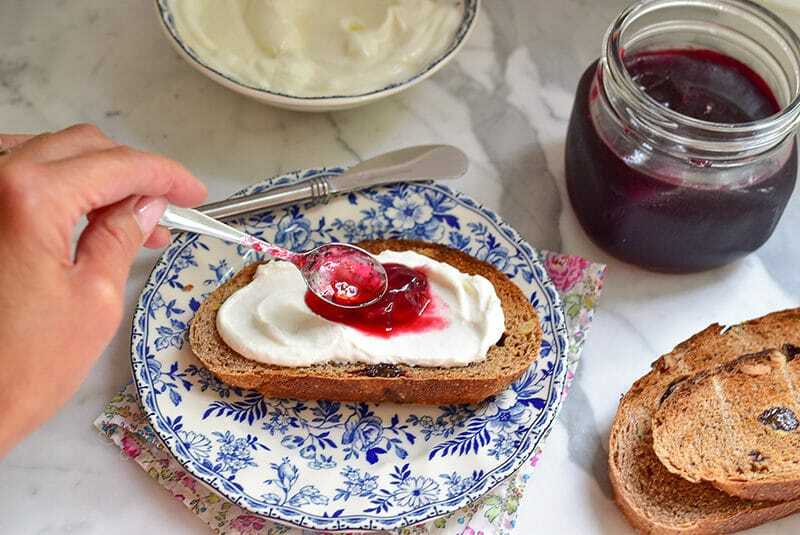 Raspberry jelly is perfection on a piece of good toast slathered with labneh. My sister likes hers in cocktails. 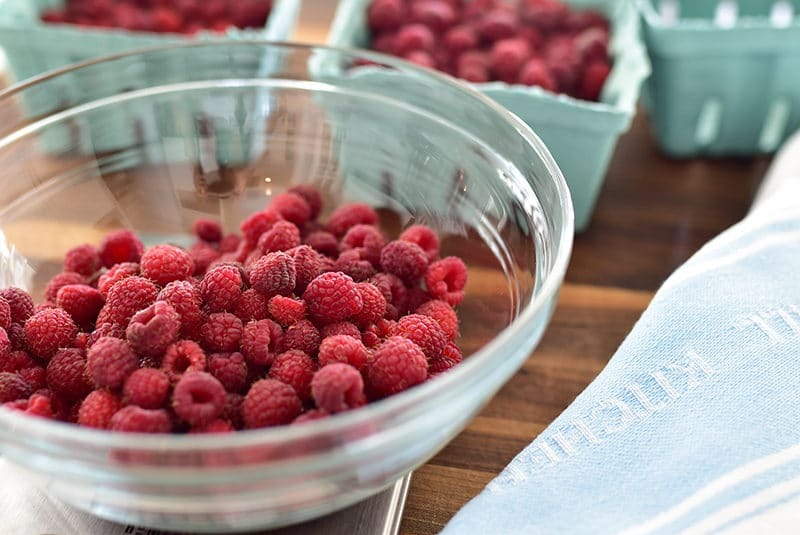 In a large, heavy pot, combine the raspberries and water. Stir constantly and bring to a boil. Reduce the heat and simmer for 5 minutes. 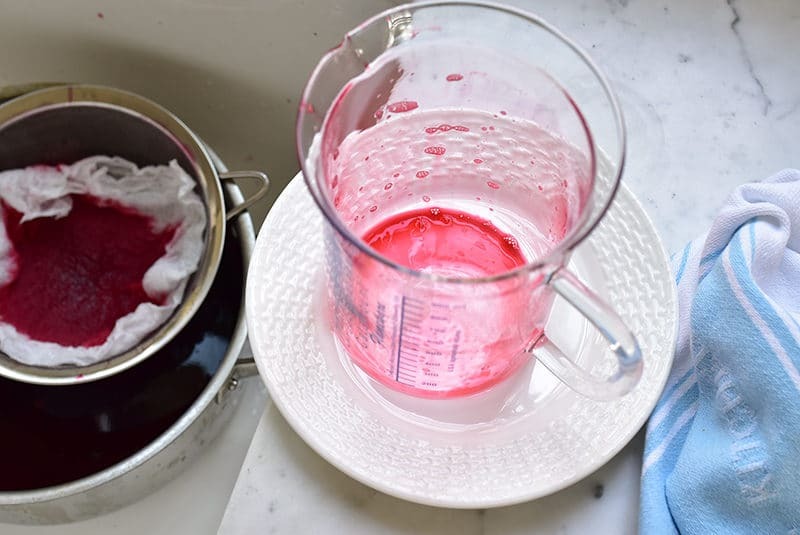 Line a fine mesh sieve with a few layers of dampened cheesecloth, set over a large bowl in the sink, and pour the raspberry mixture through, catching the juice in a large bowl. The juice should measure about 4 cups. 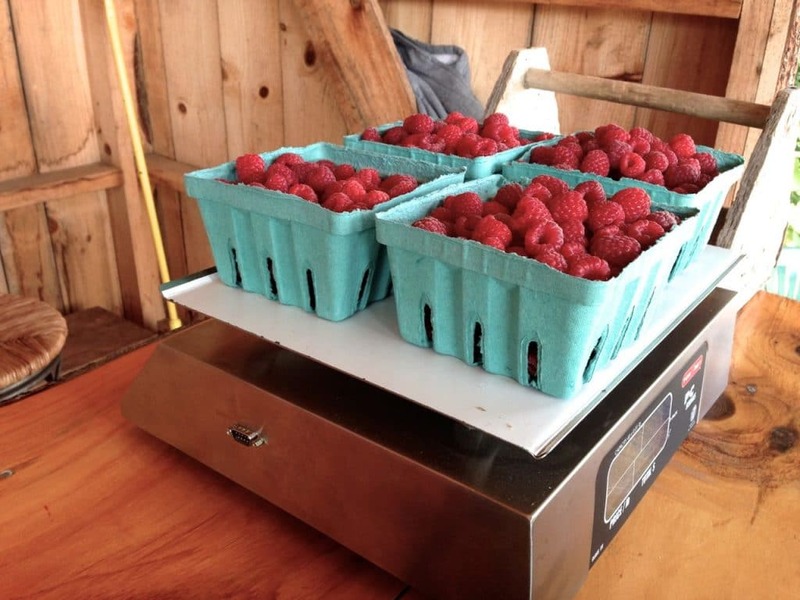 Clean the large pot of any residual raspberry pulp and seeds. Filter the juice back into the pot, again through the sieve lined with a fresh round of dampened cheesecloth layers. Add the sugar, lemon juice, and rose water. Bring to a boil and cook for 10 minutes, then skim off the foam. 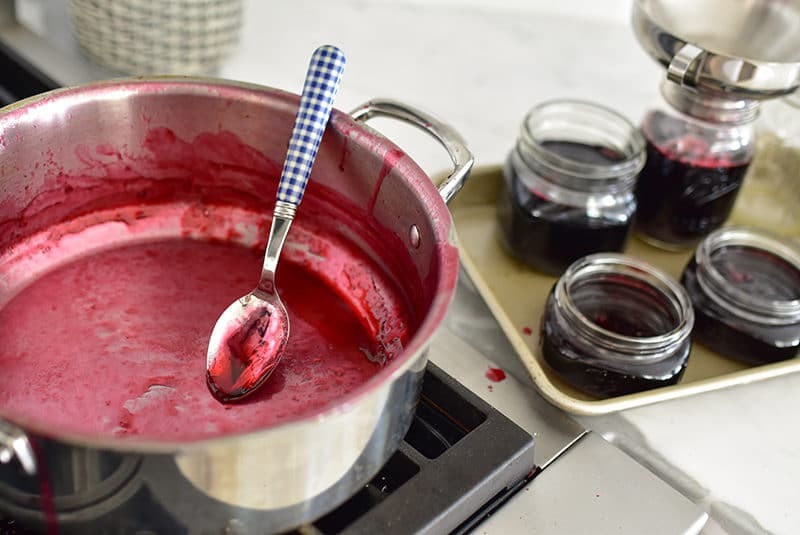 Return to a boil and cook until the jelly reaches 220 degrees on an instant-read thermometer. Ladle into clean jars, and close the lids tightly. Store in the refrigerator. 8 Responses to "Raspberry Rose Jelly"
Hi fellow apricot fan! The frozen fresh blackberries will work fine. Just taste the juice after adding the sugar and lemon to see if it needs more tartness with more lemon. Can’t wait to make this! What would you say your approximate final yield of the jelly was? Thanks for a great idea to use my frozen raspberries! Wonderful Bri–I yielded about 6 cups of jelly in the end. My mother was a great jelly maker, but she thought that pectin was a dirty word and there was never any in her kitchen! She would have loved this recipe. Wow, I’m so glad to hear that Terri. Love to see her recipes for jelly. Maybe you were the friend who brought Louise the raspberry jelly we had there a few years back?! Such a vibrant colour ! So tempting.. well done maureen ! Now I’m in desperate need of raspberry jam and labne !